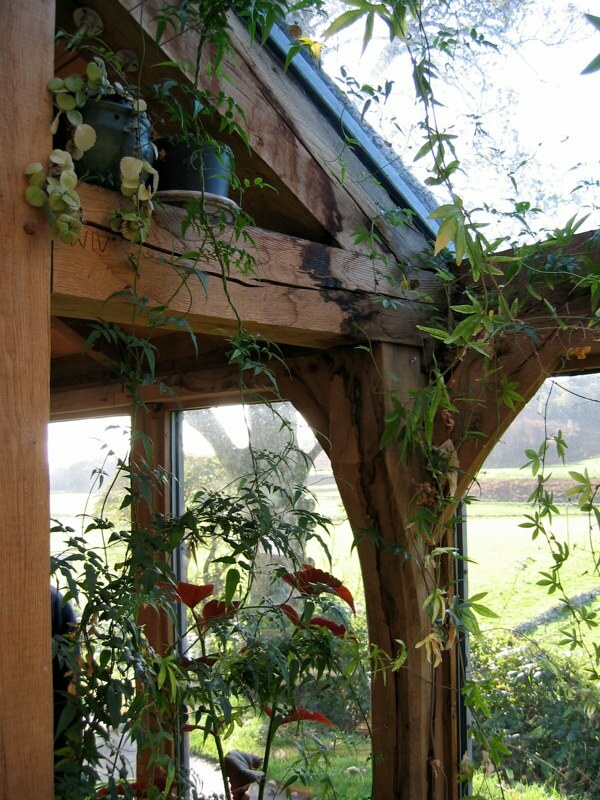 Green oak timber framing has undergone a renaissance in the last 30 years. It has gone from an almost forgotten skill to becoming an industry, with many companies specializing in this most vernacular of building styles. 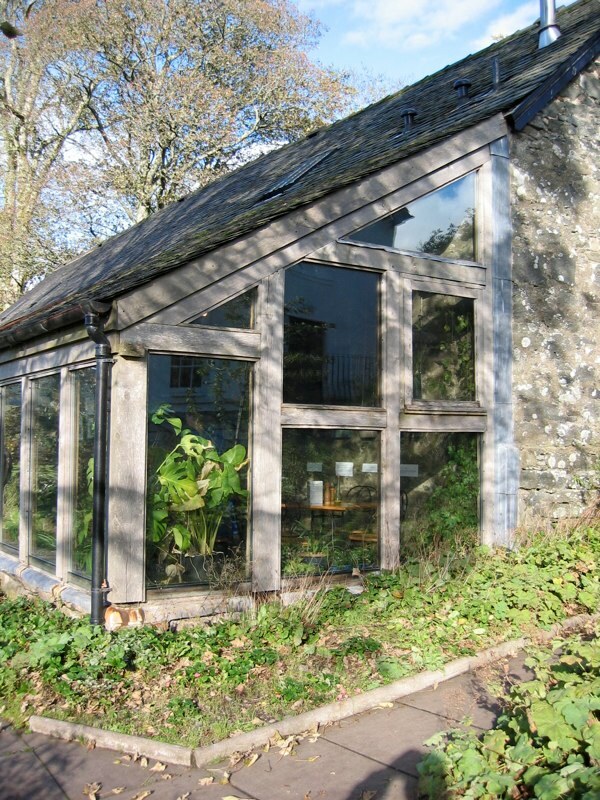 Many designers, architects and home owners have realised its potential as a modern style of building based upon traditional craft skills with inherent ecological credentials. The traditional Tudor/Jacobean style with small windows and infill panels has been developed to include large expanses of glass and joinery. The use of this most traditional of building techniques as a contemporary building style has resulted in a new look to modern building with its own peculiar set of challenges. 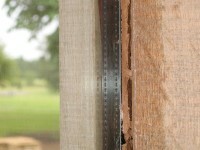 The application of glass to green oak frames has inherent problems. 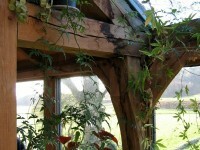 The green timber structural frame will need many years to fully dry and season. This leads to the primary problem: the glass and joinery, which are more stable and therefore less flexible elements of the building, are being installed onto a moving substrate. Over the last couple of decades a number of approaches have been tried; they all have their own peculiar benefits and weaknesses. Beading. This is the most basic approach. 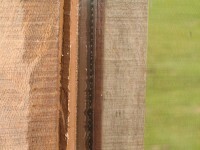 The glass is mounted between 2 beads fixed between the posts and studs of the frame and the glass is siliconed into position. It doesn’t work in the long term (and sometimes in the very short term, see Long House under projects). It is only an appropriate system were there is a very tight budget and the owners of the property are willing and capable of constantly maintaining the installation and are willing to live with some level of leakage. 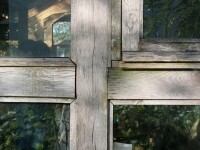 Some timber frame companies cut rebates out of the green oak frame. 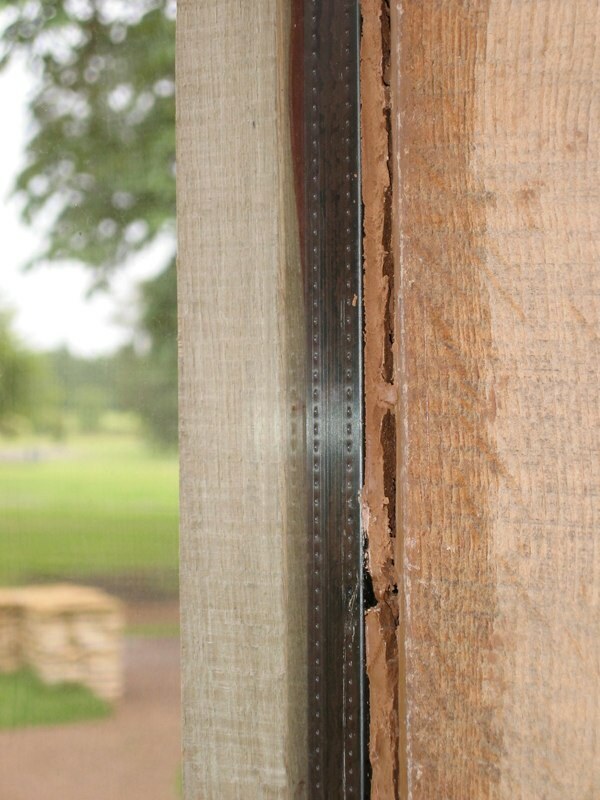 This does away with the internal bead and tidies up the installation on the inside of the building. 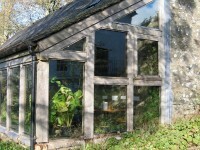 It still relies upon silicon to keep the weather out around the glass and still leaves the frame exposed on the outside. 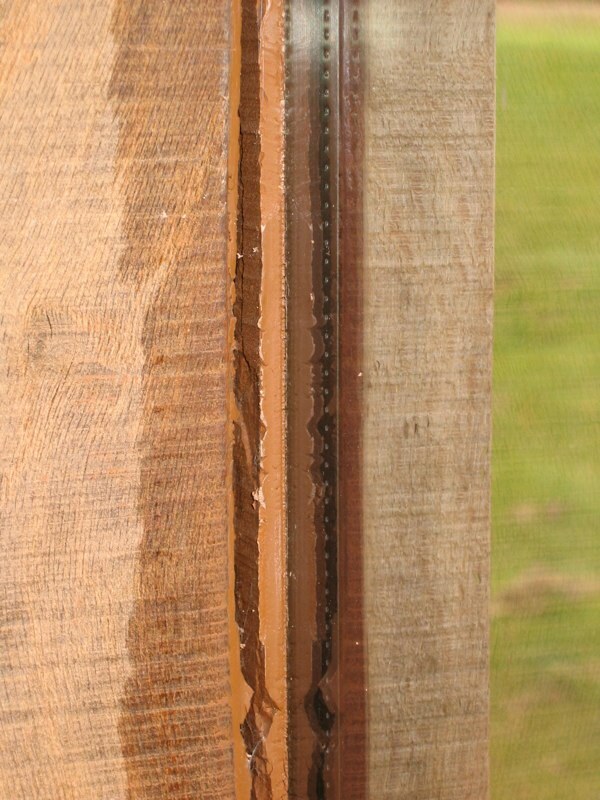 If the structural frame is made from partially air dried stock this does help to reduce movement but will increase frame cost, though it will not help with water penetration through the frame itself. In response to the problems found with glazing, some very clever individuals came up with the concept of face applied glazing. 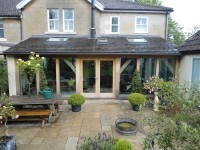 On its most basic level the glass units are clamped to the outside of the frame using oak cover boards. This system incorporated a stepped IGU with the bottom edge of the glass projecting to help throw off the elements, as illustrated by one of our earliest projects. 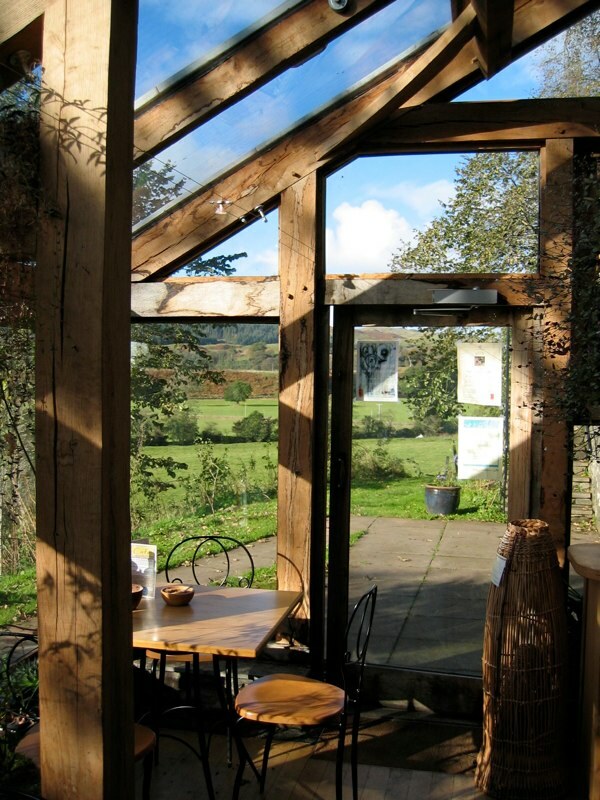 One of the great benefits of this approach is that all of the frame is visible from the inside, why pay a premium for a solid oak frame and then lose half of it in the glazing build up. This method is still being used by some and provides a reasonably reliable mid cost solution, though with limitations, this system still relies upon silicon to keep out the elements. This is the point when Black Pig became involved in the development of glazing systems for frames. 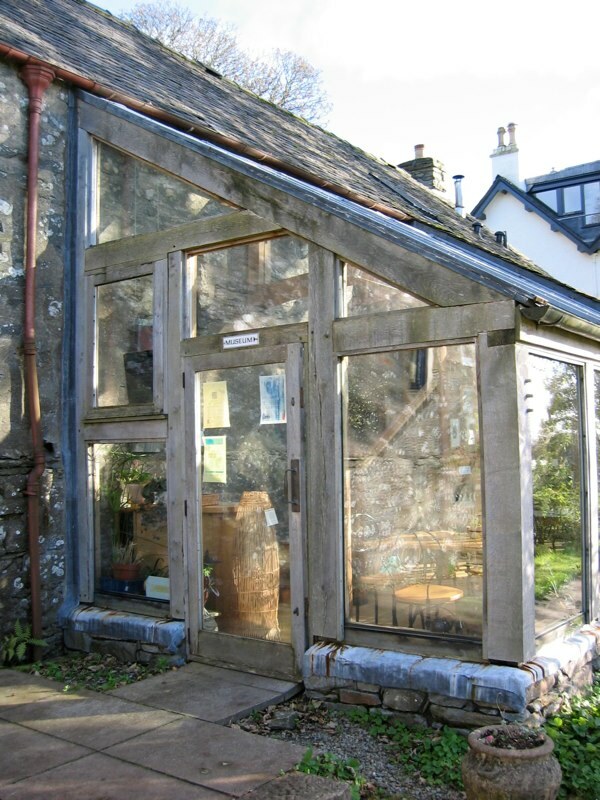 We took the existing face applied format and in discussion with Cameron Scott of Timber Design Ltd (who had already begun to experiment with dry glazing techniques) started to develop the idea further. Our development of the face applied format has improved upon a number of weaknesses of it’s forerunners and is more advanced than any other system available. 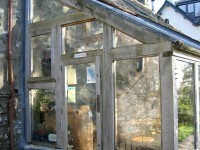 The entire structural frame is clad to protect the frame and provide a continuos waterproof seal. The IGU’s are floating to allow for movement of the frame. All weather seals are EPDM rubber to provide longevity and allow for movement. No silicon or other mastics are used, which can degrade or tear. Drainage is built into the system extending the life of the IGU’s. 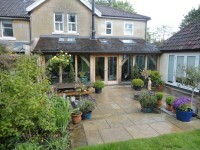 All joinery is incorporated into the system, improving performance and the aesthetics of the installation. Installations are undertaken by skilled and trained carpenters who understand their craft thus guaranteeing performance and aesthetics. We have also removed the need for the stepped IGU on walls (it is still used on roof installations). This has reduced the cost of the double glazed panel, lessened the risk of glass breakage and tidied up the visual effects of the installation. In conclusion we believe we are the leaders in our field and with in excess of 250+ projects completed we are no doubt the largest by volume. We are confident in our materials and techniques but we are continuously looking to improve. We have imitators but none that understands as well as us what is required, have our level of detailing and are actively pursuing a policy of constant development. We welcome and encourage all feed back, good and bad, as we can only improve by being informed. 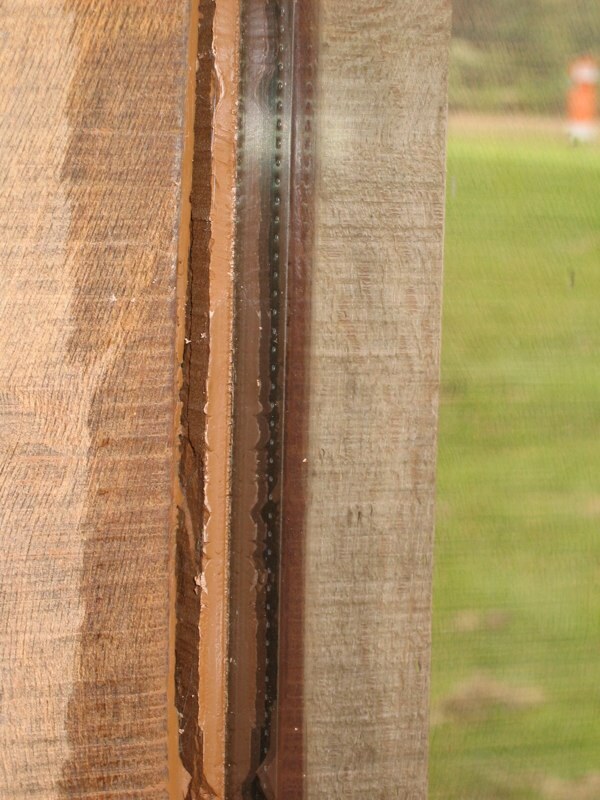 This set of photos illustrates some of the problems encountered when glazing and joinery are installed using beads and leaving the frame exposed. 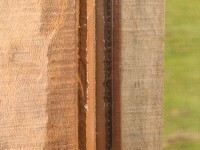 A trio of photos to illustrate some of the problems when using mastics to seal IGU’s to a green oak frame. This is an extreme example that we suspect was exacerbated by using an incorrect (and much cheaper) specification of mastic. 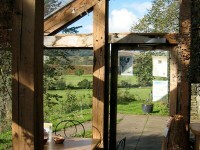 Back Pig does not use mastics, instead relying on EPDM dry glazing methods and skillful detailing.